We Nigerians are an impatient lot, impatient in all aspects of our lives; look at the way we drive on the roads, look at the way we talk and walk, look at our pecuniary ways, they way we behave generally, all very impatient, all very edgy, wanting results there and now. And because of this our impatient attitude, we have all failed to recognise and applaud President Yar'Adua's achievement to date. Let us all go down memory lane the way President Yar'Adua emerged as president: He was not interested in the office first and foremost unlike other candidates such as Dr Peter Odili and General Ibrahim Babangida. He never prepared for the position like President Obama. His political party, PDP was equally not prepared for the office, for it has no manifesto. He had the post thrust onto him by serendipity, poor soul. He had to start somewhere. So barely two month's in office, on August 1st 2007, President Yar'Adua came up with a policy, tagged the “7-Point Agenda” as the main thrust of his stewardship. Energy: We need to solve the problem of power and energy – National Council on Energy to drive the energy policy and advice on power, energy and gas… energy emergency to be declared. Security: Treating security as a critical Infrastructure. Wealth Creation: 70% of all revenue comes from oil; need to keep this focused and extended to other areas. Education: Need to address the various problems in the education sector. Land Reform: To provide proper ownership and give a chance to take the land to capital market. Mass Transit: To develop capacity for mass movement of goods and people. Niger Delta: To implement the master plan already developed. It very obvious to any observer of Nigerian affairs that to date, President Yar'Adua's 7-Point Agenda is a complete failure and a colossal waste of resources. Infact it is in disarray from the Energy situation to the Niger Delta imbroglio. But the President needs to be pardoned for this ugly situation, for he hurriedly packaged the 7-Point Agenda in two months without proper home-work, with very little preparation, for his political party, PDP did not have a manifesto. It took President Obama and his Democratic Party about four years to prepare, cost and package their own agenda. But due to our impatience as Nigerians, we want to compare USA and Nigeria or even Nigeria and Ghana. President John Atta Mills of Ghana and his National Democratic Congress has been preparing for office since 2001. President Yar'Adua was thrust onto Nigerians ill-equipped for high office. 1. The marriage of his first daughter, Zainab as the third wife to Governor Dakin Gari of Kebbi State. 2. The marriage of his second daughter, Nafisa as the fourth wife to Mallam Isa Yuguda, the Bauchi State Governor. 3. Getting his Christian female ministers to jettison western dress code in favour of traditional (Islamic) outfits. I challenge anybody who dare say that items 1 -3 above are not great but silent achievements on the part of President Yar'Adua. For starters he has used the office of the presidency to secure financial security for his daughters, Zainab and Nafisa by marrying them off to geriatrics with access to great wealth derived from Niger Delta, whether they be 2nd, 3rd or even 10th wives. Is it not the duty of a father to provide for his children? Whom amongst us as fathers will fail to secure our children's future? Do not some of us Nigerian fathers mortgage our homes and sell our properties to send our daughters to Oxford, Cambridge and Harvard Universities in order to secure their futures? Whilst Nigerians are busy behaving impatiently, President Yar'Adua has patiently provided for his daughters. On his third achievement above i.e. Traditional (Islamic) dress code for his female ministers, Nigerians again in their impatient behaviour has failed to realise that President Yar'Adua's forbears vowed to dip the Koran into the (Niger Delta) Atlantic Ocean and as Governor of Katsina State, he implemented Sharia Islamic Law in his state. The Sharia stipulates Islamic dress code for women, this he has patiently implemented in Abuja, perhaps as one of the ways of patiently achieving his forbear's wishes. Rome was not built in a day. 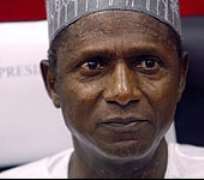 Nigerians should please forget President Yar'Adua's 7-Point Agenda for he is not interested at all in that damned thing, possibly put together without his input. After all, this is a man who prefers marrying off his daughters to wealthy geriatrics rather than educate them, despite Education being one of his 7-Point Agenda. I bet he has forgotten the 7-Point Agenda and will need access to a script to remember them. He is silently and patiently carrying out his own agenda and successfully too. We all have our own.